Scott Morris was looking for an adventure buddy for an ambitious trip in central Colorado. His email didn't elaborate beyond, "It's not an Eszter kind of a trip." Eszter Horanyi, Scott's partner, is rather accomplished when it comes to ambitious endeavors on a mountain bike, having set stout records in many of the toughest mountain bike ultras in the U.S. She and Scott were the first to pedal the entirety of the bike-legal parts of the Continental Divide Trail, a taxing backcountry affair of more than 3,000 miles–most of which is singletrack–stretching from Mexico to Canada. Their four-month pioneering trip was filled with long hike-a-bikes, miles of deadfall and sections where the trail didn't quite exist yet. So, when Scott said that it wasn't "an Eszter kind of a trip," I pictured Scott and myself schlepping our bikes up stupidly big, unrideable mountains. 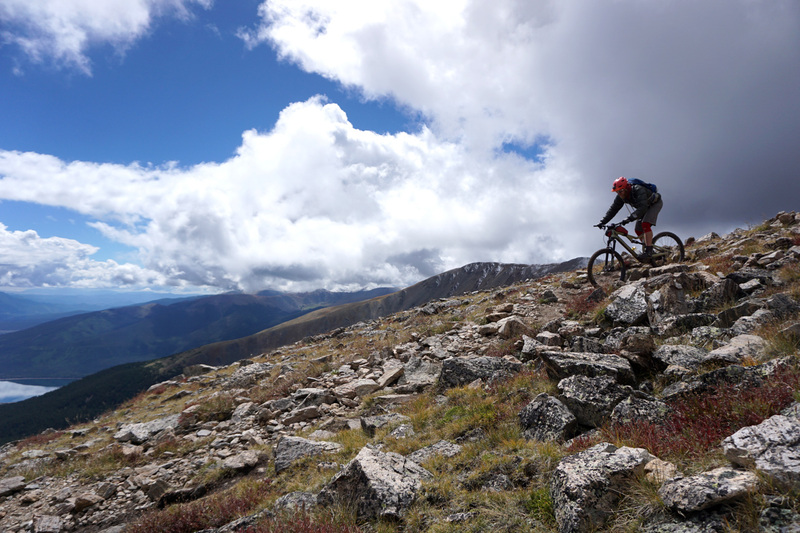 The thousands of vertical feet of talus, knife-edge ridges and cliff bands that make up Colorado's Fourteeners are mostly unsuitable for mountain bikes, but some of the peaks are open to bikes and are at least somewhat rideable–if one has an affinity for technical climbing that only relents for heavy doses of hike-a-bikes, steep, rugged descents and relatively low levels of oxygen. As if it wasn't enough to tackle all of the bike-legal and at least semi-rideable peaks of Colorado's Fourteeners, Scott wanted to link them all together on a weeklong bikepacking trip. The prospect of riding 4,000-foot descents from towering summits every day for a week was more than enough incentive for me, so the trip was a go. 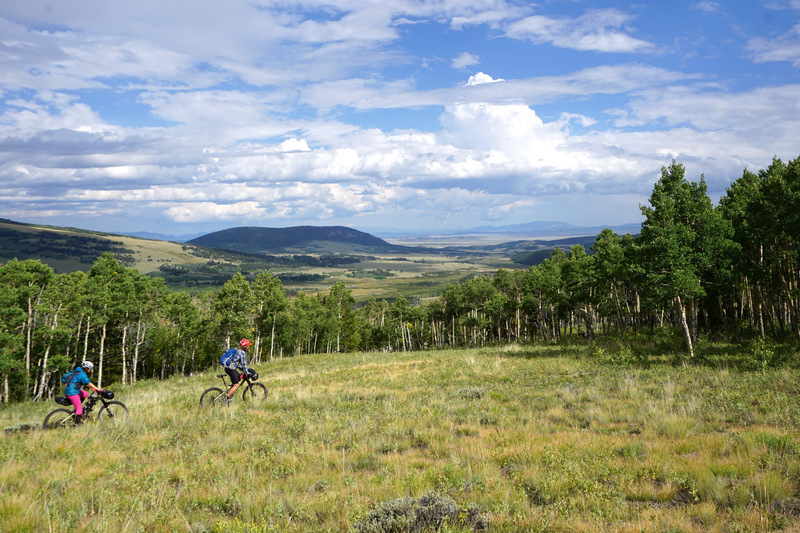 The plan was to climb the high summits in the Sawatch and Mosquito Ranges, linking up the peaks using a loop of the Colorado Trail, old, lesser-known singletrack and some dirt roads. We had eight days to cover 300 miles and climb seven Fourteeners. The dusty minivan dragged 13 feet of dusty Scamp trailer into Salida's mid-morning sun, tired from months of travel through the Colorado Rockies. Scott and Eszter unloaded, all smiles. The duo has given up ties to any one particular place, taking their lives to the places where they find fulfillment. Eszter is a writer and Scott is the technical guru behind Trackleaders.com, an adventure tracking service. Good internet is all they need to work, and that work can be fit into the spaces between riding, running, bikepacking and spending time with friends. Scott rattled off all the friends who have passed through their various campsites in recent months, stopping to hang out and play on bikes or foot. He couldn't finish the list before Eszter interrupted to tell about bikepacking the White Rim Jeep Trail in Utah’s Canyonlands National Park three times in as many weeks, once with Scott, once with a couple other women and once with her father to celebrate his birthday. Scott and Eszter laughed, looking entirely at ease with their mobile lifestyle, and then Scott finished his list with a few additional visitors who had stopped by. 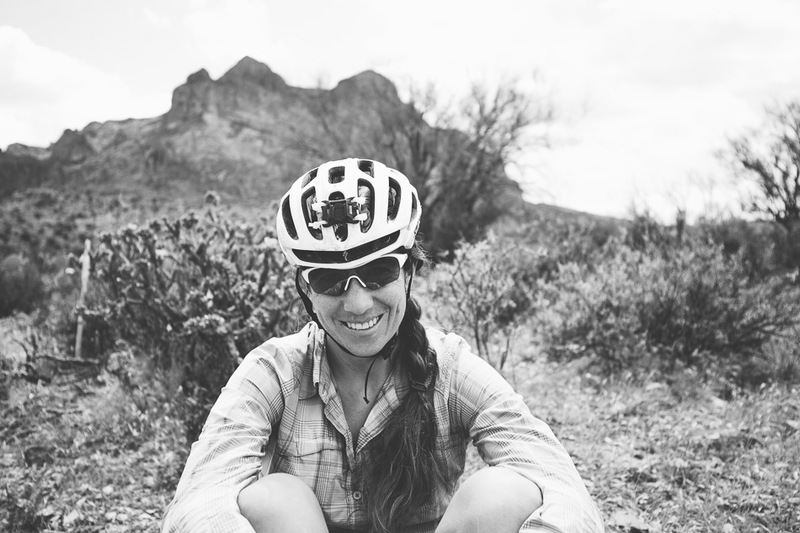 "That's more friends than would ever come visit us if we just stayed in Tucson or Durango," Eszter said with a grin. Eszter had joined us on the first night of the Fourteeners trip, opting to run up Mount Shavano and Antero as we pushed our bikes up. She planned to drive to the San Juan Mountains afterward for her own adventure. I was still busy packing my bags and organizing a couple day's worth of food when Scott and Eszter locked up their Scamp and went off to grab lunch. Turns out, there aren't as many decisions to be made when all your bikepacking gear fits into a single box. These two exemplify of how life can become simplified in smaller spaces, even if that space happens to have two little wheels and a license plate. 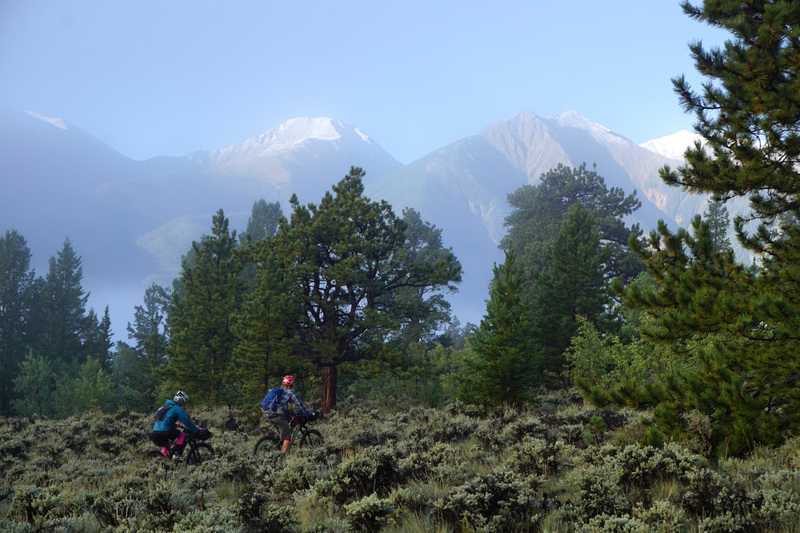 Two mornings later, our tired legs eased into the day on rolling Colorado Trail singletrack along the flank of the Collegiate Range. After a couple hard days on alpine singletrack, two big summits and two mind-blowing descents, our bodies were already feeling worked. "This is so nice!" Eszter exclaimed as we cruised along. "I had forgotten how much fun riding bikes is." She was unexpectedly still with us, having decided to stick around for one more day to run another peak. And now she was liking the idea of climbing Mount Huron, our next objective. In the preceding months, Eszter's interest had turned toward trail running. She even ended up ‘accidentally’ racing what is likely the toughest 50-mile trail ultra in the country. For someone who claims to be retired from Type II fun, that sure sounded like a sufferfest me. "I didn't mean to sign up," Eszter explained. "I just wanted to know if I could potentially get into the race since Scott was doing the tracking for it. Then the director just put me on the start list. I couldn't really back out of that one." The aspen groves through which we rode were just starting to show yellows and oranges, and a dusting of snow on the distant peaks made clear that summer was ending. "We'll wait until the leaves peak around here and then head back to the desert," said Scott. "Probably Moab. We waited too long to go out there last fall and sort of missed out on the prime autumn riding." "Definitely Moab," Eszter chimed in. "I just have a couple more things I want to take care of in the mountains first." A lengthy list of peaks and routes followed–too many even for Eszter to check off before the leaves drop, but for these two, that's just incentive to return next year. Scott and Eszter have made it a point to structure their lives in such away that this is possible, creating work for themselves, living frugally and chasing happiness over anything else. After finishing graduate school, Scott sold his house in Tucson and migrated between the Sonoran Desert in the winter and various mountains in the summer. Eszter wrapped up graduate school in Boulder and then cobbled together work in Crested Butte before being drawn to the desert. After tackling the Continental Divide Trail, the pair bounced all over the West in a minivan loaded with bikes and a tent. Somewhere along the way, they decided to spend a winter setting themselves up for a freer existence. 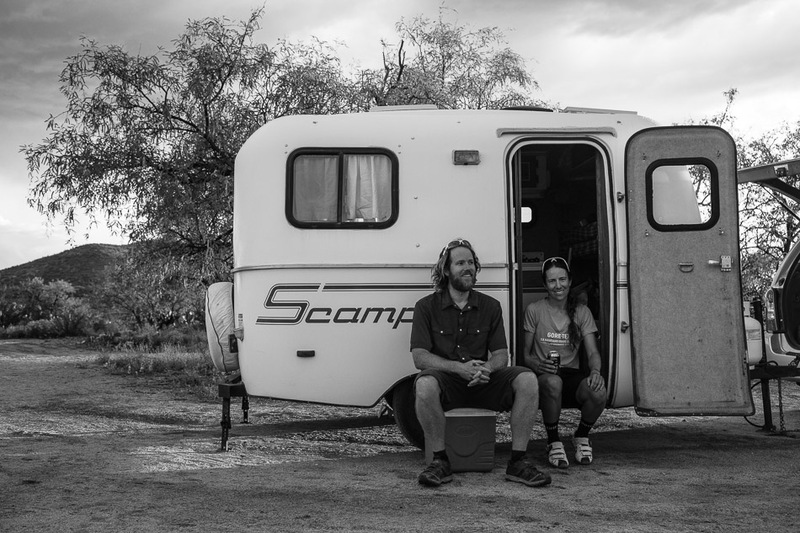 They bought a little Scamp trailer, pared down their possessions and settled on a fleet of just one bike each. I rolled out from beneath my covers and peered out the window. Rain was no longer falling, but the air was saturated, creating a fog so dense I could barely make out the trees just across the road. Late the prior afternoon, we had beaten the approaching rain to an old mining town by mere minutes and opted to grab a room at the inn. None of us were compelled to continue on and camp in the wet, and some unanticipated rest rejuvenated our tired muscles. After breakfast and coffee, we ventured out into a damp, chilly morning. The fog cleared just enough to see the summit of Mount Elbert high above, with fresh snow creeping nearly to the tree line. The highest peak in the state–and now probably the snowiest–was our goal for the day. "Huh. This sun will melt that all off," I said with sincere optimism, met only with skeptical laughter. "Well, something's gonna happen. It always does," Eszter replied with her usual acceptance of uncertainty. And with that, we pedaled on to the Mount Elbert trailhead and started up toward the summit without further discussion of the snow. Eszter scampered off up the trail on foot in her new hot pink thrift-store tights (having packed for just one night out left her a bit short on warm clothing). Scott and I settled into an alternating rhythm of granny gears and hiking, and marched on for hours. Then the unexpected happened. The trail abruptly became almost entirely rideable. Switchbacks were marginally navigable and seemingly loose rocks were stuck in place just enough to find traction. Scott's drive to try to ride everything astounded me. 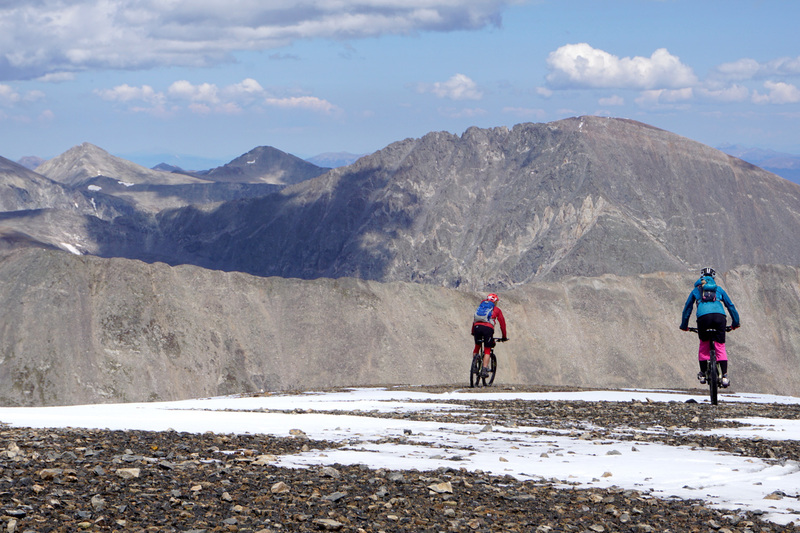 He whooped and hollered with delight while slinging switchbacks at 14,000 feet, stopping after every few to lean over the handlebars and gasp for oxygen. We cheered each other as Scott grew more and more energized. Eszter again laughed at us as she ran past going the other way, looking far fresher than I was feeling. We only took a few minutes to recover and absorb the view afforded by the summit. Clouds were building quickly, so we didn't dare take too long before pointing the bikes down the rocky trail. We dropped for 4,000 feet, swooping first through alpine switchbacks and then rocky turns in the forest, ears popping and mouths grinning all the way back to where Eszter was waiting. 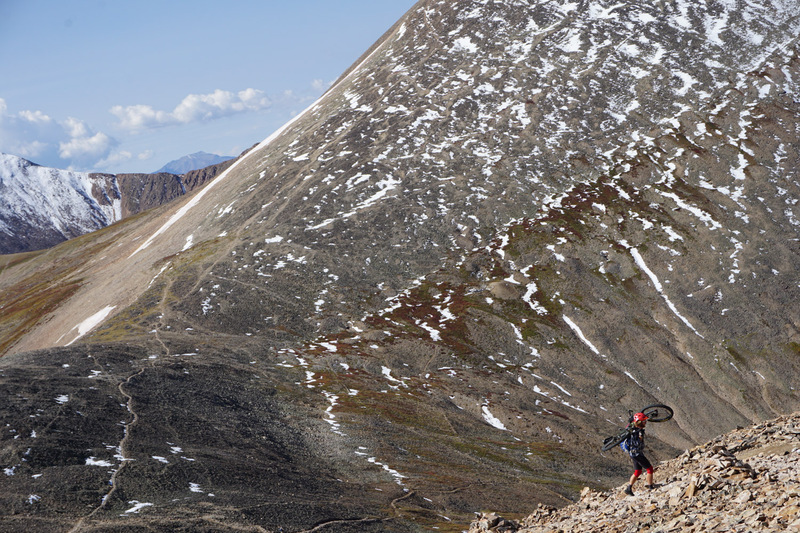 Towering above Leadville is Mount Sherman, a monstrous mass of shattered rock. While we had checked off the most physically challenging peak on the first day of our trip, we had apparently left the most technical one for last. There would be no pleasant alpine meadows or rolling ridges here, and the last couple thousand feet of the climb is nothing more than a slightly smoothed path up a ridgeline of scree and talus. After riding both peaks with Scott and me the prior day, Eszter ditched her bike at the end of the highest mine road and now wasn't even bothering to try to run up the loose ridgeline. Hikers asked if there was a good trail off the other side of the mountain, and I could only reply, "No, we'll go down this same way." At the summit, the three of us basked in the glow of having made it up all the peaks we wanted to summit (with the exception of a blizzard-driven retreat off Huron) and tried to identify all the peaks and mountain ranges that surrounded us. Eventually, we took a few deep breaths and began the treacherous descent. The compulsion to at least try to ride down was strong enough that I couldn't resist, and neither could Scott. The loose rocks shifted around precariously beneath our tires, but never before had I ridden such a spectacular line with nothing but sky on both sides. As the trail mellowed out well below the summit, my focus relaxed, leaving me exhausted and a bit shaky. The expressions worn by Scott and Eszter communicated a deep satisfaction in what we had accomplished over the past week. Moments like this are why they've chosen the life they live. We coasted back to our camp, packed up slowly and drank a couple more cups of coffee before beginning the day-and-a-half ride back to Salida. There was more great trail ahead. Check out more bikepacking articles in our Fully Loaded series. 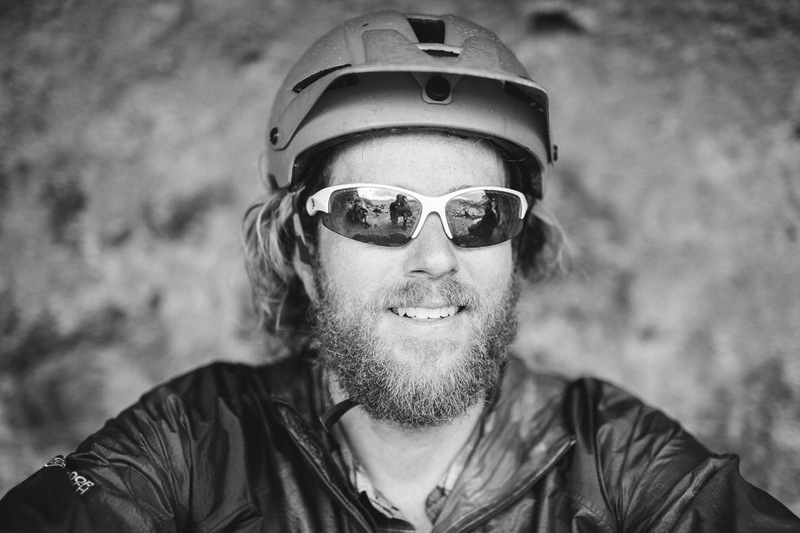 About the author: Since falling in love with bikes as a kid while sporting a “MacGyver”-inspired mullet, Kurt Refsnider has bikepacked in countries across the globe and has won numerous bikepacking races. He is a geology professor at Prescott College where he teaches Geology through Bikepacking and coaches the school's Division II cycling team. He is also the founder of Ultra MTB Consulting and offers coaching and consulting for endurance cyclists and bikepackers.